The Native American Tribes Names and Locations of a particular Tribe in North America is not always an indicator of where they live now or, where they originated. This subject requires a little research because so many of them were forcibly made to relocate or they choose to migrate to new locations of their own accord. Fortunately, there is a lot of information available as meticulous records were kept for much of this activity. It is estimated that before the European arrival around 10 million Indians lived in North America, today in the U.S. as of the 2010 census there are 2,932,248 with 567 federally recognized Tribes and, 326 separate Indian Reservations. The names of our 50 U.S. States can reveal a lot about a Tribes name and who lived there at the time of their naming. Some examples of this are, Alabama: this is a Choctaw Tribe word who spoke the Muskhogean language (Allah ammo) meaning plant cutters so, we know the Choctaw lived here at one time. The Creek and the Cherokee also inhabited this region as well. Arkansas comes from the French pronunciation of an Algonquin Tribe word (Akansa) and Siouan Tribe word (kk’a: ze) for the Tribes who lived there at the time and is translated to mean downriver people. Another good example is Arizona; this name comes from the O’odham Tribe word (Ali-Sonag) then the Spanish corrupted this into the word (Arizona) meaning Good Oak. In the Eastern Algonquin Nation, the Mohican Tribe gave us the name Connecticut meaning “at the long tidal river”. Both North and South Dakota are named after the Dakota Tribe, their word (Dakota) means friendly or Allies. Kansas is named after the Kansa Tribe and it means “people of the south wind”. Kentucky is from the Shawnee or Wyandot language meaning “on the meadow”. Massachusetts is an Algonquin for “at the large hill” named for the Great Blue Hill SouthWest of Boston. Michigan is also Algonquin; it is a French corruption of the word (Meshi-Gami) ” Big Lake”. Canada, much like the United States has a very large number of registered Native American Tribes. As of 201,5, that number was at 634 where they are referred to as the New Nations. Some of the more predominant Tribes Names are the Winnipesaukee and Wampanoag. The Huron and the Nakotchokutchin, the Squamish and the Ottawa. The Chippewa, Micmac, Bellacoola, Assiniboin, Kwakiutl just to name a few. The majority of Tribes are in the Western Provinces however, there is the New Nations territory in all eleven of Canada’s Provinces. Their population of 1,335,653 represents 3.86% of Canada’s total population. Of the 567 Tribes in the U.S. and almost 3 million individuals, almost half belong to one of 10 of the largest Tribes, though, they are subdivided into many other smaller Tribes. Their names from the most populous are Cherokee, Navajo, Sioux, Chippewa, Choctaw, Apache, Pueblo, Iroquois, Creek, and the Blackfeet. 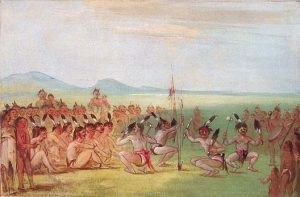 At the time of European arrival on the East Coast of the U.S., the Algonquian Indian Nation was the most predominant. 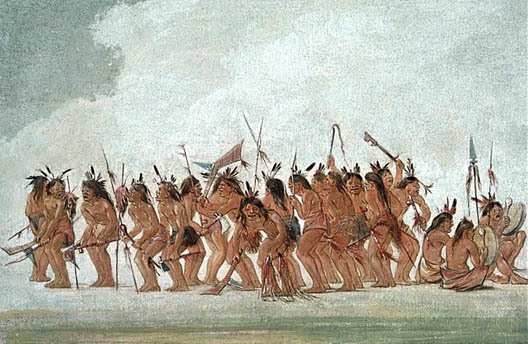 Algonquian Indians accounted for the largest number of Tribes first encountered by settlers, here are some examples. In the NorthEast the Colonist of the Massachusetts Bay area met the Wampanoag, Pennacook, Quinnipiac and Passamaquoddy Tribes. In Southern New England they encountered the Mohegan, Pequot, Pocumtuc and Tunxis Tribes, while in Maine, New Hampshire, and Vermont they met the Abenaki Tribe. All of these Tribes practiced agriculture, hunting, and fishing and for the most part were peaceful Tribes. Further South from Eastern Pennsylvania and I to the lower Hudson River Valley, Delaware, and New Jersey were the Lenape Tribe, also known as the Delaware Tribe. Then in the Chesapeake area, a different Indian Nation called the Powhatan maintained a loose group of Tribes that numbered into the 10’s of thousands at the time. They included the Chickahominy, Nanticoke and the Wicocomico Tribes. The first English Colonies, such as at Jamestown were the first Europeans to met these Tribes. These are but a small example of the many Tribes that once lived and thrived in this part of the Country. In the Southeastern United States, there were at least 29 major different Tribes with many more branches springing from these around the time of European arrival. These areas include Mississippi, Alabama, Florida, Georgia, Tennessee, both Carolina’s, parts of Kentucky and Virginia. Perhaps the most famous of these Tribes in American History was the Cherokee. They were a peaceful people and were even willing to adapt and conform to a European lifestyle so long as they could remain on their ancestral land. However, 1828 when the white man discovered gold in Dahlonega, Ga. In the heart of Cherokee territory and, confrontation became inevitable they were forced from their land. The Indian Removal Act of 1830 by Congress sealed their fate, as well as the Tribes of the Creek, Salusa, Seminole, Muscogee, Choctaw, Chickasaw, Caddo and many others. Thus began the infamous Trail of Tears, which was actually not one, but a series of forced removal. The Cherokee; however, suffered the most casualties in the last of these forced removals in 1838 when 16,543 Indians were marched on foot in the winter by the U.S. Army from Chattanooga, Tennessee to present-day Oklahoma. As many as 6,000 died on this perilous journey leaving behind the land on which they had lived for over a thousand years.